... switch on and have fun! The LXR is equipped with 7 instruments and is very easy to use and effective. ... If it is z. For example, when it comes to creativity, it concerns the sound design of the individual (7) instruments, and in particular the unbelievable variety concerning the change of individual instruments. 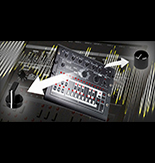 All (7) instruments can be so detuned that you can create with them, so to speak, 8 or 12bit sounds. Although it is not such a device. Of course, this also works with all other instruments. No matter what kind of sound the box is currently carrying on your ear, it sounds incredibly clear and bold! If you are looking for a really good drum synthesizer, you are really well advised with the LXR from Sonic-Potions!